So you’d like to hear another story about Vault Hunters, eh? 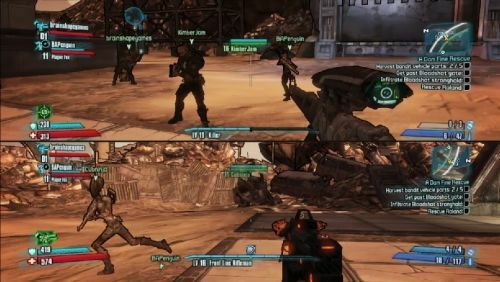 Borderlands 2 may be the most anticipated game of 2012. I logged hundreds of hours into the original RPG/shooter while playing as several characters. I had very high expectations for Borderlands 2, and it met or exceeded most of them. Assemble your fellow Vault Hunters and prepare for a glorious return to Pandora. As soon as I fired up the looter shooter I was greeted with a simultaneously understated yet kickass opening cinematic. My wife, and co-op partner for life, decided it warranted multiple viewings. We chose our characters, decked them out with a small selection of customization options, and began our new adventure. I picked Salvador the Gunzerker, because I like to move forward while killing things without the hindrance of thought. She chose the Commando, Axton, because she enjoys using automated turrets to obliterate her enemies while observing the chaos of battle. Plus..."He’s hot." Her words, not mine. Like its predecessor, Borderlands 2 is built specifically for cooperative play. The main menu doubles as a matchmaking lobby, displaying what your friends are doing, what classes they are playing, and what mission they are working on. Starting a local or online co-op session is simple. You can read all of the technical details of story progression, enemy scaling, loot, and leveling in our Co-Op FAQ. I’ll sum it up by saying that you can play online with up to four players, locally with two players via split screen, and the game supports combo co-op. This means my wife and I can play split screen with two other online players. We can even take our local game online with another couple who are also playing split screen. Yes, that’s four players on two systems. It’s the best double date ever, because I don’t have to leave the house. All of this is done through a magical drop-in/drop out system that boggles my little co-op loving mind. Here's the horizontal split orientation. We're playing online with four players on two systems. Our story begins with- wait, wait, wait. I’m not going to ruin the story for you. You’ll want to experience it for yourself. While the original Borderlands had some great writing and colorful humor, at times it lacked direction and had a rather anticlimactic ending. Sure, the DLCs expanded on the fiction of Pandora, but the core game’s plot was a little disjointed. Borderlands 2 still features the same absurd, over-the-top-humor. Non player characters (NPCs) are animated, making them feel like more than just a Bounty Board with a face. Some characters actually walk around Sanctuary, remedying the ghost town aura of part one’s New Haven, T-Bone Junction, and Tartarus Station. I felt much more invested in the plot of this game, and actually cared about what was happening to the characters. All of the major NPCs from the first Borderlands make an appearance, including some favorites from the DLC packages. You’ll encounter Claptrap, Scooter, Marcus, and many more, new and old. They’re all written well and often hilarious. This helps disguise the fact that most missions they'll send you on are simple fetch quests that include murderizing all the bad guys in the area. It's a game about looting and shooting things, what more could you want? The original Vault Hunters are also incorporated into the story, and they are used remarkably well. You are going to love to hate this guy. 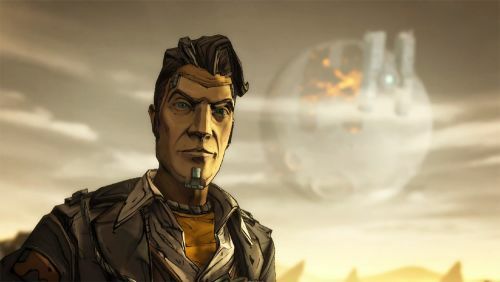 One of the shining stars of Borderlands 2 is Handsome Jack, the villainous, sharp-tongued leader of the Hyperion Corporation. While the original Borderlands lacked a proper antagonist, Jack is the perfect embodiment of an omniscient evil. His giant space station looms over Pandora like a hi-tech Eye of Sauron. He’ll frequently contact you through your ECHO device to hurl insults and mock your efforts. He reminds me of General Knoxx, only he’s far more pleased with himself. Once we were armed and had talked to a few characters we sunk our teeth into the actual game. Like the first Borderlands, our action skills didn’t unlock until we reached level five. As soon as my Gunzerking skill popped I began to build the character that complimented my play style. Certain classes lend themselves toward particular strategies and weapons, but if you want to build a rocket Assassin or a shotgun Siren, feel free to experiment. You can always respec skill points for a small fee. The gameplay of Borderlands 2 is familiar, yet refined. I played the game solo, as part of a duo, and with three and four players. As a single player game, I found the game to be a satisfying treasure hunt. I took my time and explored the wilderness of Pandora. Gone are the brown junkyards and barren wastelands. Okay, there are still plenty of junkyards and wastelands, but now green vistas and icy tundras break up the desolate landscapes. The lonely Pandoran twang of the music was familiar, and when the rhythm stepped up I knew I was in for a real fight. For my solo run I played as Zer0, the Assassin. His ability to snipe and displace using his Deception cloaking skill is great for solo play. Also, he’s a ninja. So there. 2K are OK to Have a XBLA Sale, Right? Borderlands DLC Sale. Page created in 0.3150 seconds.